I do not post to often these days but apparently I have a good excuse: I'm knitting instead! 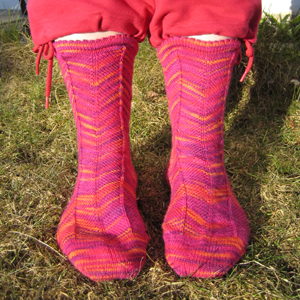 See, another pair of socks done! 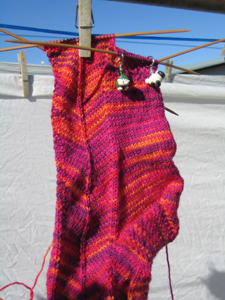 Wait... Underestimating the chilly wind, I discovered a new way of blocking! Freezing socks in form! 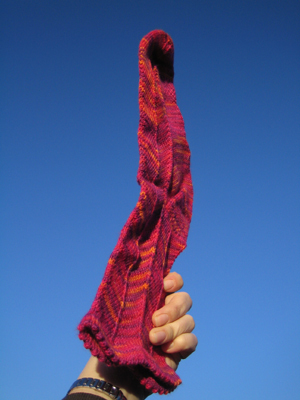 Even obstacles in the knitting process only make one stronger. 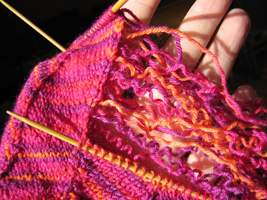 For me, I learned that I cannot only save one or two dropped or wrong-way cabled stitches but drop the stitches of an entire needle for a re-do. Very nice. 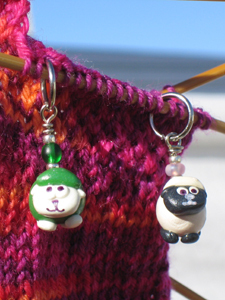 If you don't know these cute stitch markers already then go here. Katie was very busy designing unnaturally coloured sheep this time (well.. talking about the green one above) and started a Project Spectrum Sheep Club. Meaning, you will get a sheep in each month's colour if you join. Fabulous idea! by Carola at 10:10 e.h.
apríl 03, 2006 10:47 e.h. I am still laughing at the socksicle! I am jealous of my little sheep for getting to spend so much time with those lovely colors. apríl 03, 2006 11:15 e.h. Isn't Lorna's Laces a wonderful sock yarn? The Bittersweet colorway worked out perfectly for your Jaywalkers. I hope there is more LL in the stash for future socks! apríl 04, 2006 8:56 f.h. ack, so beautiful! look at those colours! apríl 04, 2006 10:47 f.h. When I first saw the picture I thought, how did she do that, it looks like it's frozen! Great colorway, and I love your red Pomi socks too. apríl 04, 2006 4:17 e.h. I want to be your sock pal. :-) Those are SO pretty! apríl 04, 2006 4:31 e.h.
apríl 04, 2006 7:09 e.h.
apríl 22, 2006 3:22 f.h.